Edit: Permission to edit information within the Camper module (i.e. family and camper data, including camper bunks). Enrollment processing: Permission to process enrollment requests and enroll campers. Delete and merge: Permission to delete and merge family and camper profile pages. Financial read: Permission to view basic financial information (such as transactions and payment methods) on family profile pages. Post mass transactions from Advanced reports: Permission to post mass transactions from Advanced reports of the same transaction types they are permitted to create individually. Create charges: Permission to post new charges to a family's account. Create discounts: Permission to post new discounts to a family's account. Create payments: Permission to post new payments to a family's account. Create refunds: Permission to post new refunds to a family's account. Create credits: Permission to post new credits to a family's account. Reverse transactions: Permission to reverse transactions of any type they have permission to create. Delete transactions: Permission to delete transactions of any type they have permission to create. Financial management: Permission to create and manage financial information on a family's profile, such as editing existing transaction details, adding/removing payment methods and payment schedules, and accessing "financial notes." Financial reports: Permission to access all Camper financial reports on the Financial dashboard. Admin: Permission to create + manage Family and Camper notes categories, and designate which users have access to view and create notes in those categories. To allow an admin user to view notes on your camper or family profiles, go to Admin > Camper or Family tab > Notes > double click the pencil icon to edit the appropriate Notes category > Select the admin user > Edit category > Save changes. View + manage Advanced reports: Permission to access the Camper advanced reports page (i.e. create and save reports; manage advanced report categories). Send e-mail from Advanced reports: Permission to send a mass e-mail to everyone generated in a Camper advanced report. Export spreadsheets from Advanced reports: Permission to download data from a Camper advanced report as a spreadsheet. 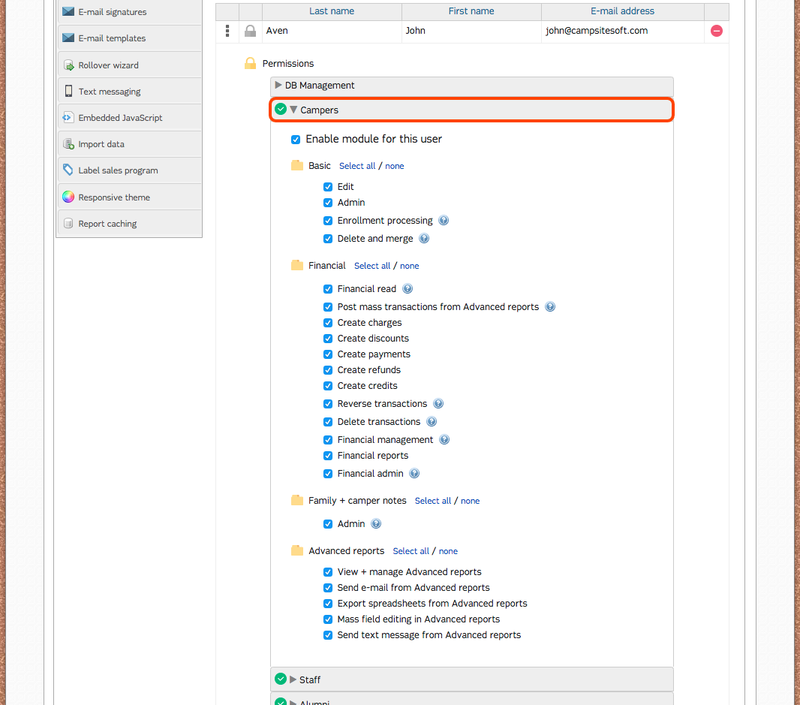 Mass field editing in Advanced reports: Permission to use the "Edit" button in the Camper advanced report toolbar to mass edit camper or family profile data. Send text message from Advanced reports: Permission to send a mass text message to every parent generated in a Camper advanced report.